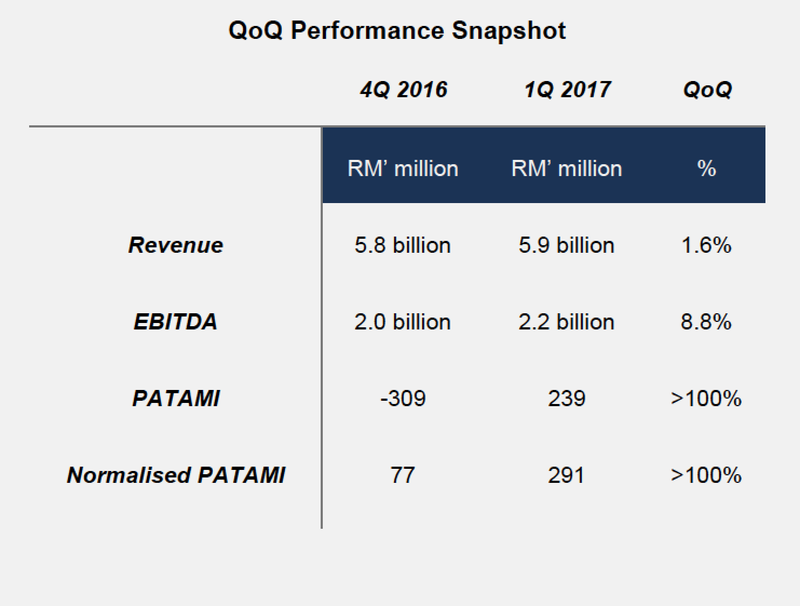 Kuala Lumpur, 25 May 2017 – Axiata Group Berhad (“Axiata” or “the Group”) today posted improved QoQ performance on all key financial metrics in its unaudited financial performance for the first quarter ending 31 March 2017. Revenue for the Group stood at RM5.9 billion for the quarter on the back of strong growth in Data revenue which grew almost 10% QoQ and 43.3% YoY to now account for 40.9% of total service revenue. EBITDA was up by 8.8% to RM2.2 billion as a result of better performance from the Operating Companies (OpCos) and greater cost efficiencies. Lower Depreciation and Amortisation (D&A) and net finance cost, as well as forex gains led to the Group’s normalised PATAMI improving to RM291 million as compared to RM77 million in the preceding quarter. 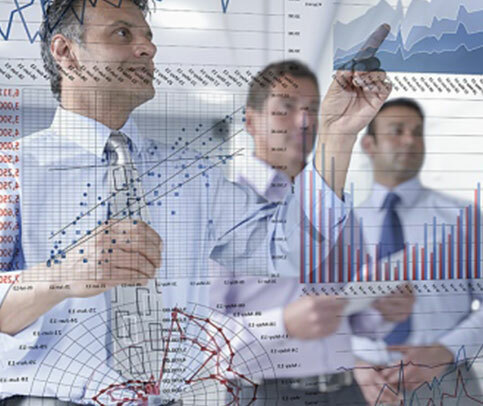 Prudent execution of financial management initiatives in the quarter resulted in a stronger balance sheet. The Group successfully pared RM1.6 billion loans including its US Dollar exposed debts by USD213 million. Improvements in EBITDA further led to gross debt/EBITDA to fall below its debt covenant of 2.5x, reducing from 2.64x in the preceding quarter to 2.40x in the current quarter. Cash balance also grew from RM5.3 billion to RM6.7 billion, a healthy 26.1% growth, over the period. Amidst hyper competition and depressed industry growth in the first quarter, Celcom grew its postpaid revenue by 1.2% QoQ driven by its enhanced postpaid plans, First Gold 80 and First Platinum. This in turn delivered higher ARPU at RM81 to show signs of softening revenue decline. Data revenue grew 29.8% YoY and contributed 44.8% to total service revenue. XL’s transformation agenda has started to deliver better financial performance in addition to continued operational strength. For the quarter, XL showed better-than-industry growth in both total revenue and EBITDA. XL also recorded its third consecutive quarter of service revenue growth driven by an 8.9% increase in Data revenue. Smart continued its strong performance fueled by excellent data monetization and effective cost management with Data accounting for 52.3% of total service revenue. Despite regulatory challenges, the South Asia markets continued to deliver strong performance with Data making stronger contributions to the Group. Coming off a stellar year, Dialog yet again delivered another solid YoY revenue growth with Data revenue growing at 41.7%, however, its QoQ performance was impacted, along with industry, by the re-introduction of VAT for a full quarter. Robi showed overall strong QoQ growth performance and increased its Data revenue YoY by 83.0%. Ncell saw PAT margin increase YoY from continued efforts in cost-control initiatives with Data revenue growing by 70.3% YoY, accounting for 17.0% of Ncell’s total revenue. Further building on its 2016 maiden equity private placement exercise with final deal closing at USD700 million, a USD100 million upsize, edoctco welcomed pension fund, Kumpulan Wang Persaraan (Diperbadankan) (KWAP), as its third investor in April 2017. edotco continues to grow organically with its strong focus on innovation and sustainable solutions, recently implementing the first bamboo tower designed in Bangladesh. edotco now operates and manages approximately 25,800 towers across its footprint, making it the 12th largest tower company globally. In its strategic investments toward becoming a Digital Champion, Axiata Digital continued to strategically grow its portfolio of digital assets with further service launches and partnerships, having invested in 29 digital companies involved in mobile money, e-commerce, media and advertising; and other technology enablers. The Group’s associates and joint ventures registered a negative contribution of RM31 million for the quarter, largely due to Idea in India. Tan Sri Jamaludin Ibrahim, President & Group Chief Executive Officer of Axiata said, “Coming off a very challenging year, I am encouraged by the overall improved performance for the quarter. The turnaround at Celcom is progressing on track and showing some stabilisation. XL’s new strategy, after some challenges last year, is coming together well especially in the data leadership of the XL brand and better results in geographical areas outside Java. However, at both companies, there are still lots more required. Our investments in data are being monetized with Data revenue at Celcom, XL and Smart accounting for 40% - 50% of total service revenue. As one of the largest Asian telecommunication companies, Axiata today operates in ten countries, servicing approximately 320 million subscribers. With a diverse portfolio in mobile network operations, communications infrastructure services and digital services, the Group pieces together the best in connectivity, technology and people in its vision of Advancing Asia. Axiata has controlling stakes in market leading mobile operators in South East Asia and South Asia. Axiata Group of companies operate under the brand name of ‘Celcom’ in Malaysia, ‘XL’ in Indonesia, ‘Dialog’ in Sri Lanka, ‘Robi’ in Bangladesh, ‘Smart’ in Cambodia and 'Ncell' in Nepal. Further to this, the Group also holds strategic interests in ‘Idea’ in India and ‘M1’ in Singapore. ‘edotco’, the Group’s infrastructure company, operates in six countries to deliver telecommunications infrastructure services, amassing a portfolio of over 16,000 towers and 12,000 km of fibre. It aims to be one of the top regional tower companies and is committed to responsible and sustainable business operations. Axiata Digital (AD), its digital services arm, captures the rapid growth in internet-based businesses through its portfolio of 29 digital brands, servicing growing demands in mobile money, mobile adverting, e-commerce, entertainment and education.